Nazarene Bible College is one of the ten Nazarene institutions of higher education in the United States. It is one of the two institutions charged by the denomination with the relatively exclusive task of preparing ministers rather than with the broader assignment of providing liberal arts education for both laity and clergy. It is the only U.S. institution of the Church of the Nazarene given the responsibility and funding to deliver multicultural contextual education. Graduates of the four-year Bachelor of Arts in Ministry degree, with a major in Pastoral Ministries, meet denominational requirements for ordination to the ministry. The college was authorized by the General Assembly of the Church of the Nazarene in session at Portland, Oregon, in June of 1964. The mandate of the assembly was that the college would be created during the following quadrennium. A board of trustees was elected, and Dr. Charles H. Strickland was chosen as the first president. In the providence of God, Colorado Springs was selected as the site. The college opened in September 1967 in facilities provided by First Church of the Nazarene. New buildings at the permanent location were occupied by the end of the first school year, and the new campus was dedicated in October of 1968. Dr. L. S. Oliver, chosen in 1972 to succeed Dr. Strickland as president, served until 1984 when Dr. Jerry D. Lambert was elected. In 1994, Dr. Hiram E. Sanders was elected fourth president of Nazarene Bible College and served until his retirement in 2006. Dr. Harold B. Graves Jr. was elected and assumed his position as fifth president of the college in 2006. The college was granted applicant status by the Association for Biblical Higher Education (ABHE) in 1972, candidate status in 1974, and accreditation in 1976. The accreditation was reaffirmed in 1986, 1996, 2007, and 2017. Nazarene Bible College was chartered by the State of Colorado as a non-profit educational institution in 1967. It was approved by the Colorado Department of Education to grant degrees under Section 124-21-3 CS '63 (1965 Supp.) in 1970. The four-year Bachelor of Arts in Ministry (B.A.Min.) degree and the two-year Associate of Arts in Ministry (A.A.Min.) degree have been approved by the state. 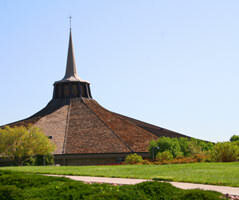 In 1970, the college was approved by the United States Department of Justice for the education of foreign students. It has been certified since 1975 by the Department of Education for eligibility to participate in federally-sponsored student aid programs. In 2006, the college was granted regional accreditation by the Higher Learning Commission (HLC). The accreditation was reaffirmed in 2011. Decentralization of the college’s operations began in June 2017. 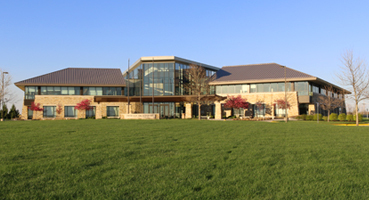 The administrative team moved to the Church of the Nazarene’s Global Ministry Center in Lenexa, Kansas. Campus courses moved to facilities leased from Colorado Springs First Church of the Nazarene. The school’s Information Technology center remained on the college’s original campus. NBC’s students, 95% of whom study online, complete their courses wherever their internet connection intersects with the college’s learning management system. Nazarene Bible College from its beginning has been innovative in its approach to preparing adults for ministry in the Church. We were the first bible college established by the Church of the Nazarene for the purpose of preparing men and women for ministry in the United States. In the 1980's we decentralized our educational model by partnering with districts across the US to offer ministerial education preparation for students where they lived. In 1998, we were the first Nazarene institution to offer a higher education degree online. As we enter our 51st year, NBC is opening an exciting new chapter in the life of the college. The school is transitioning to a distance education model with a leaner organizational structure, a relocated center of operations, outsourced support services, and a full-time faculty that serves the college from remote locations. The New NBC now has administrative operations located at the Church of the Nazarene’s Global Ministry Center (GMC) in Lenexa, Kansas; classroom and administrative office space for campus students completing their education at Colorado Springs First Church of the Nazarene; full-time faculty telecommuting with the college and their students; and mission critical computer system servers also located in Colorado Springs, Colorado along with IT support staff. Nazarene Bible College continues to be a leader in training men and women for ministry. The New NBC remains committed to our mission of glorifying Jesus Christ as Lord by preparing adults to evangelize, disciple, and minister to the world.